A look at who gains and who loses if Enbridge's proposed Northern Gateway oil pipeline goes ahead. The Northern Gateway project is a proposal by Canadian oil and gas company Enbridge to build two pipelines stretching 1,177-km between the Alberta oilsands and the West Coast. The Northern Gateway would have the capacity to transport 525,000 barrels of oil per day. The $5.5-billion project would consist of two pipelines: one transporting oil in a westerly direction from Bruderheim, Alta., to the port of Kitimat, B.C., from where it would be shipped to international markets in Asia and the northwestern United States; and another carrying imported natural-gas condensate in the opposite direction. The condensate is a toxic mix of liquid hydrocarbons that forms during the extraction of natural gas and is used as a thinning agent to dilute and help transport heavy oils like bitumen. The majority of the pipeline would be buried underground, with the exception of a few water crossings where it is deemed safer to run the pipes above water. The project would also include the building of a new marine terminal in Kitimat. Where do things stand on approval of the project? A joint review panel of experts established by the minister of the environment and the National Energy Board is currently studying the environmental impact of the Enbridge proposal. Public hearings on the pipeline project began Jan. 10 in Kitimat. Additional hearings will be held in several locations in B.C. and Alberta through to the end of March. That part of the process is expected to take until early 2013, with the panel's report expected by the end of that year. The panel will submit a final report to the government and once it receives a response will decide whether or not to approve the project. If the panel rules that the project may proceed, they will set "conditions that Northern Gateway must meet." According to the panel's website, then the cabinet "can either accept or reject the decision, but cannot modify it." If the panel rules that the project should not proceed, then there is nothing for the cabinet to decide, said Annie Roy, the panel's spokesperson. If they win approval, Enbridge expects the pipelines to be operational in 2017. Enbridge claims the project would generate about 3,000 construction jobs and 560 longer-term positions, as well as an additional 1,150 manufacturing and maintenance jobs to keep the lines in operation. Enbridge's proposal to build a pipeline that would carry petroleum from the Alberta oilsands to the West Coast has communities arguing over potential benefits and environmental risks. Enbridge, whose Hardisty, Alta., storage facility is shown above, is Canada's largest transporter of crude oil. (Larry MacDougal/Canadian Press )The company says the Northern Gateway would produce approximately $2.6 billion in total local, provincial and federal tax revenues during 30 years of operation. Through an ownership stake and contributions to a community trust, Enbridge has offered an estimated $380 million over the life of the project to aboriginal communities on whose land the pipeline would be built. "It's clearly in our national interest to have competition for our resources, in the same way that it is important for B.C. 's forest and mining industries to access markets outside North America." Federal Natural Resources Minister Joe Oliver also claims that pipelines are "the safest form" of transporting oil and that "technology is improving the safety of tankers." What are the concerns about the project? Environmental groups and some fishermen, municipalities and aboriginal communities oppose the pipeline. 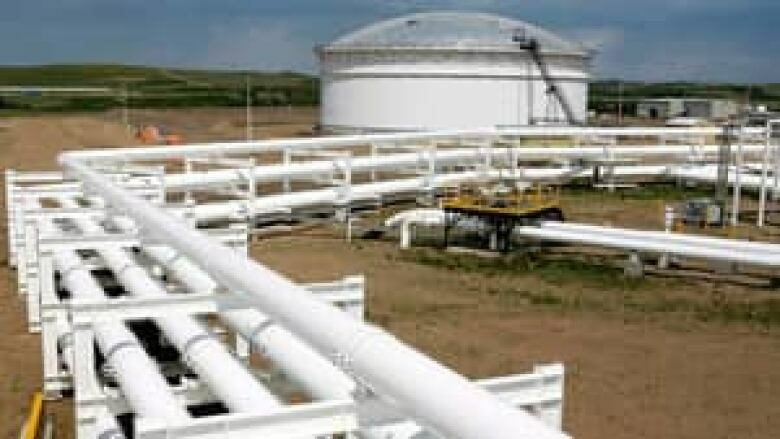 Environmentalists' first objection is with the oilsands themselves and with the increased extraction of oil from the oilsands that the pipeline would bring. They argue that the process pollutes the air and nearby lakes, rivers and watersheds, destroys wildlife habitats, releases large amounts of greenhouse gases and threatens the health of surrounding communities. They and some of the communities that would be affected by the pipelines, which will run through the Mackenzie, Fraser and Skeena watersheds, are also concerned about the possibility of a large oil spill or leak. According to the Pembina Institute, the Natural Resources Defense Council and the Living Oceans Society, which issued a joint report on the impact of the proposed pipeline in November 2011, "diluted bitumen may weaken pipelines at a faster rate than conventional oil due to its acidic, sulphuric, abrasive and viscous nature." The three groups also claim that if a spill were to occur, it would be "especially hazardous due to the explosive properties of diluted bitumen and the concentration of toxins." Should a pipeline spill occur in a remote area, which much of the proposed pipeline route is, detection and cleanup would be difficult, especially in winter, the environmentalists worry. What are the concerns about shipping the petroleum from Kitimat? From Kitimat, oil tankers transport the bitumen though 185 km of inner coastal waters, a route that the environmentalists claim poses navigational challenges. That route also passes through the Great Bear Rainforest, which the federal and B.C. governments have pledged will be a protected area. Because bitumen can sink in water, a cleanup would be "very challenging," say the three environmental groups, and Canada's pipeline regulations do not specifically address shipping bitumen. Other critics claim that exporting the petroleum from the oilsands rather than refining it in Canada amounts to exporting jobs, as well. The imbalance between those who stand to benefit from the pipeline (Enbridge; federal, provincial and local recipients of tax revenue; and native groups that have bought into the project) and those who face the greatest environmental risks (aboriginal and other northern B.C. residents) has also been raised.